Act No. 522, Public Acts of 2002, pp 1-5. Note that the gross appropriation is much lower than previous years since much of the federal “No Child Left Behind Act” funding has been integrated into the state school aid appropriations bill, Act No. 191, Public Acts of 2002. 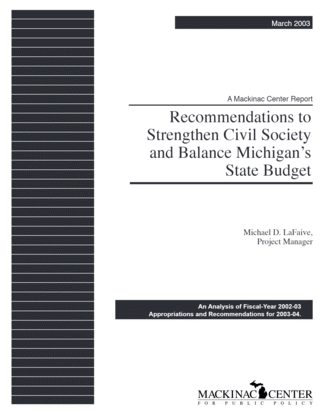 This figure is negative due to the Mackinac Center for Public Policy recommendation that the Michigan merit award board/MEAP Administration be transferred to the Department of Education from the Department of Treasury. Act No. 522, p. 2. A number of private companies, such as Sears Authorized Driving School, Inc. and ABC Driving School in Detroit already offer private driver education classes. See Peter Leeson, “On the Road to Privatization,” Michigan Privatization Report, Spring 1998, accessible on the Internet at http://www.mackinac.org/642. See, for example, Danielle Dunne Wilcox, “The National Board for Professional Teaching Standards: Can It Live Up to Its Promise?” in “Better Teachers, Better Schools,” Marci Kanstoroom and Chester E. Finn, Jr., editors., Washington, D.C., Thomas B. Fordham Foundation, 1999.